Go to www.vetopropac.com/springpromo and fill out the information for purchases made between March 1, 2019 and June 30, 2019. 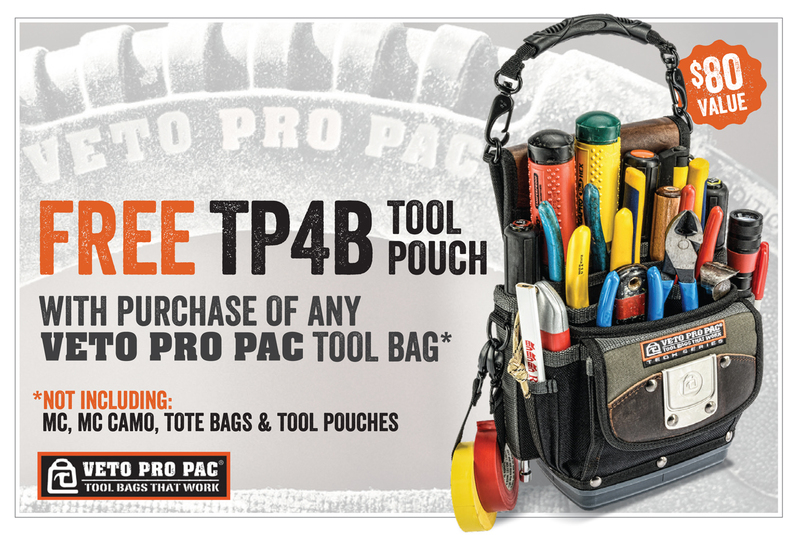 You must submit your information by August 15, 2019 in order to receive a FREE TP4B Tool Pouch. Offer valid only on purchases from March 1, 2019 through June 30, 2019. Redemption claims must be postmarked or submitted online by August 15, 2019. Please allow 4 to 8 weeks for delivery. If redemption is not received in 12 weeks, call 877-847-1443. Offer good in U.S. and Canada only and void where prohibited, taxed or restricted by law (free product must ship within the U.S. or Canada). Limit ten (10) redemptions per household. Only original proof of purchase (UPC symbol) and original copy of sales receipt must be submitted. Participant acknowledges that purchases made and submitted in connection with this program cannot be combined with any other rebate/redemption offer or other promotion. Resellers of Veto Pro Pac products are excluded from this promotion. Veto Pro Pac, LLC is not responsible for lost, late or non-delivered responses. Offer void if original UPC symbol, copy of sales receipt and completed form are not submitted. Program is not available for purchases of factory reconditioned products. 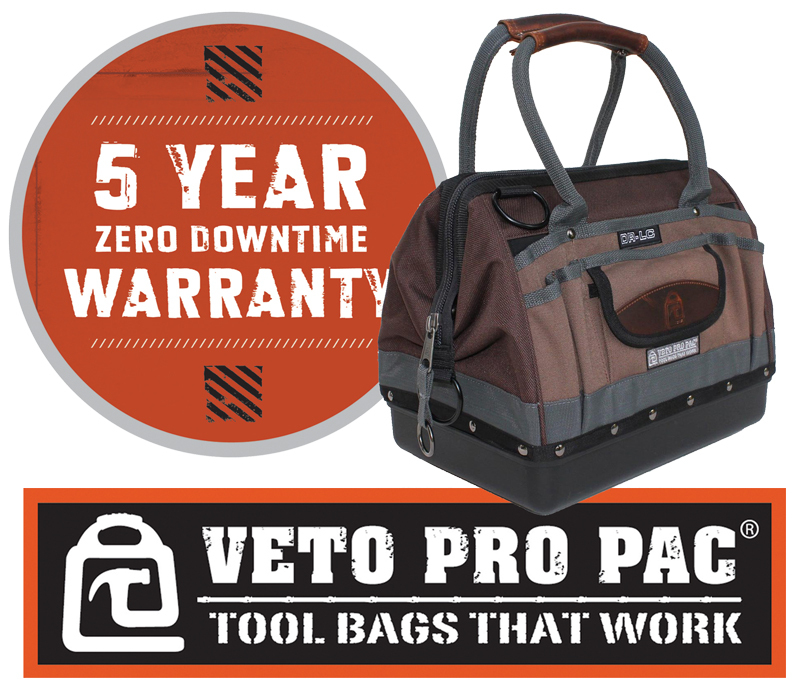 Veto Pro Pac reserves the right to substitute products of equal or greater value if any product is unavailable. Terms and conditions of this Online Redemption are subject to change without notice. Offer valid for U.S. and Canadian residents only. No one in Kentucky stocks and sells more Veto Bags than we do. Stop in today and see our selection of professional tool bags by Veto Pro Pac. The Veto DR-LC is a compact gate mouth style bag with a padded adjustable panel system to secure chargers and batteries for cordless power tools. Or take the system out and use as a “Go To” tool bag.